← Wu Ling Shu and Additional Support! Wu Ling Shu funds to make way for the Valkyrie. We made Wu Ling Shu a reality! You have all made this possible by spreading the word, digging deep and holding fast! Now that we have filled the slots for the NAPALM LEVEL there is nothing holding us back! $80,000 ACHIEVED – THANK YOU!!! Wuxia heroine Wu Ling Shu comes to fight for family honor. 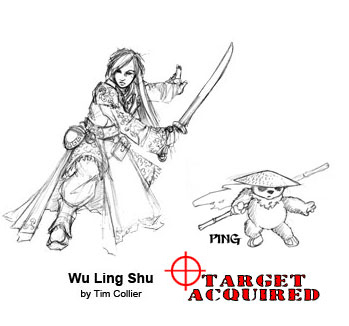 This goal makes Wu Ling Shu available as an additional Babes choice at any level that has a Babes choice as a reward. Wu Ling Shu also gets someone to watch her back, so Sidekick Ping will join the fight with her and is added to every BOMB KIT absolutely FREE! 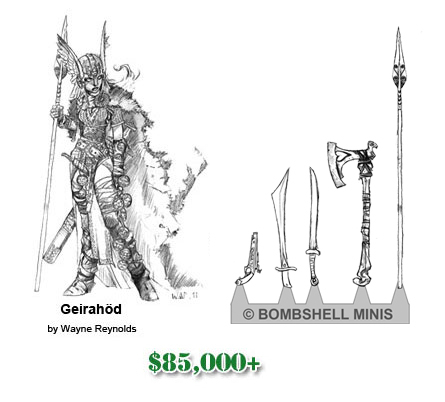 $85,000+ Chooser of the Slain Geirahöd the Valkyrie will swoop to the battlefield as an additional Babes choice at any level that has a Babes choice as a reward. Along with that, when the goal is reached, we will add a Fantasy Weapon Sprue to every BOMB KIT for FREE! The name Geirahöð is connected to the Old Norse words geirr (“spear”) and höð (“battle”). It appears in some manuscripts of Grímnismál in place of the valkyrie name Geirölul. I purchased the original drawing for Geirahöð from Wayne Reynolds while at Reaper Con in 2011. After contacting him and requesting to purchase the rights to the art for miniature production he was very agreeable. So we now include her here as the next goal to achieve to make her available as an additional Babe selection. 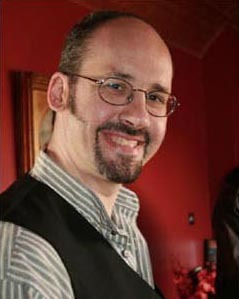 Wayne is a highly popular artist with card art, cover art and interior art for some of the largest publishers in the gaming industry. He is known for dynamic action scenes, detailed character designs and pointy sideburns. Wayne paints exclusively with a traditional process of paint on board rendering some of the most iconic images for games like Magic the Gathering, Dungeons & Dragons and Pathfinder. Onward, humans, to glory! Let’s rock out this final week of the project and set Bombshell up to do great things! I am working on several of the concepts currently and will have more photos of the sculpts as they progress.